Chinese jewelry and objects of adornment are exquisite puzzles: Why does a delicate, wafer-thin pendant feature a pair of catfish twisting upon each other to create a yin-yang? What’s the meaning of the kingfisher feathers that have been inlaid, cloisonné-like, on a gilt-metal hairpin? And could someone please explain the story behind all those lotus blossoms, which can be found on everything from earrings to belt hooks? 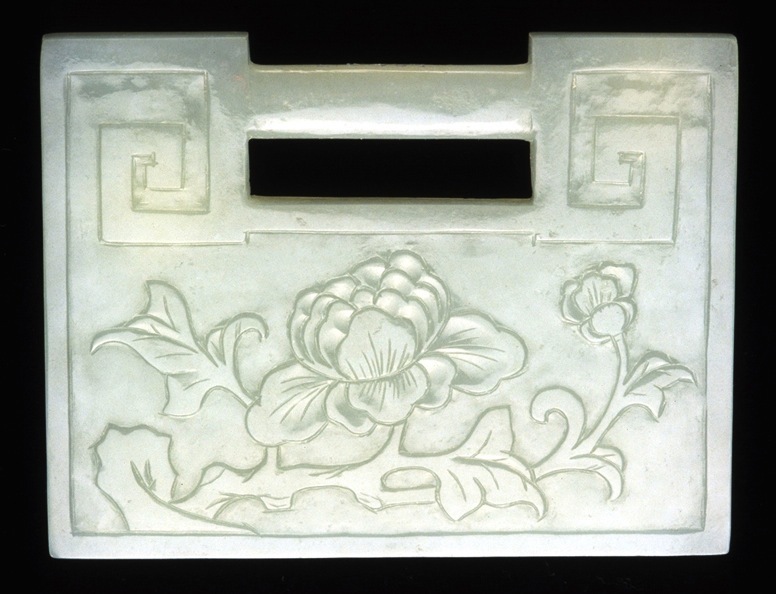 The puzzles found on jade jewelry are particularly rich. Whether it’s the rare, emerald-green jadeite from Burma or the more common mineral, nephrite, which ranges from off-whites to sage-greens, jade is treated with great deference in China, where it’s considered a link to spiritual realms. Today, the carved stone is also a symbol of a more earthly pursuit—market speculation on the part of dealers and collectors alike. In fact, in some circles, jade has become a preferred substitute for paper money, especially when it’s time to dispense a few key bribes. 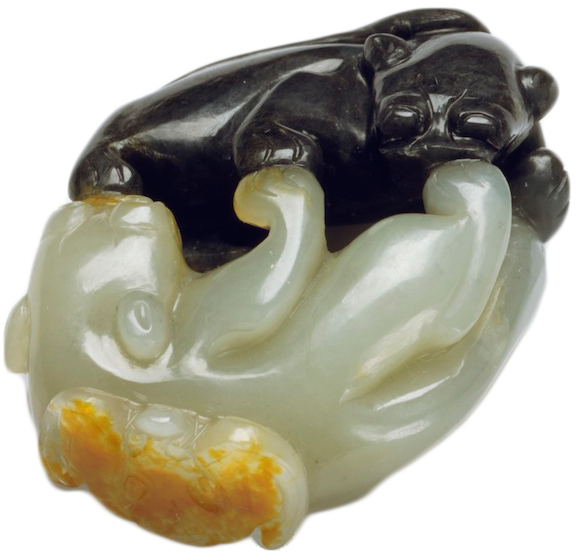 Understanding the iconography on Chinese jade jewelry helps explain why these pieces are so prized. It’s not just the satisfaction that comes from solving the puzzle—for the record, the catfish symbolize a happy marriage, kingfishers are associated with longevity, and the lotus stands for harmony. 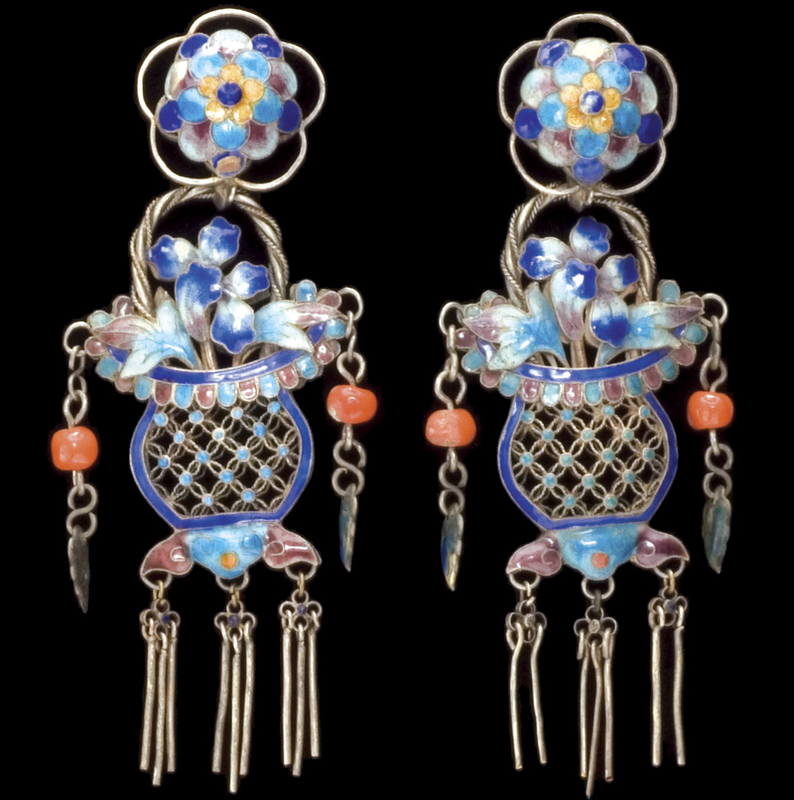 Rather, the symbols on Chinese jewelry reveal the often single-minded traditions that have guided Chinese civilization for thousands of years, and continue to this day. 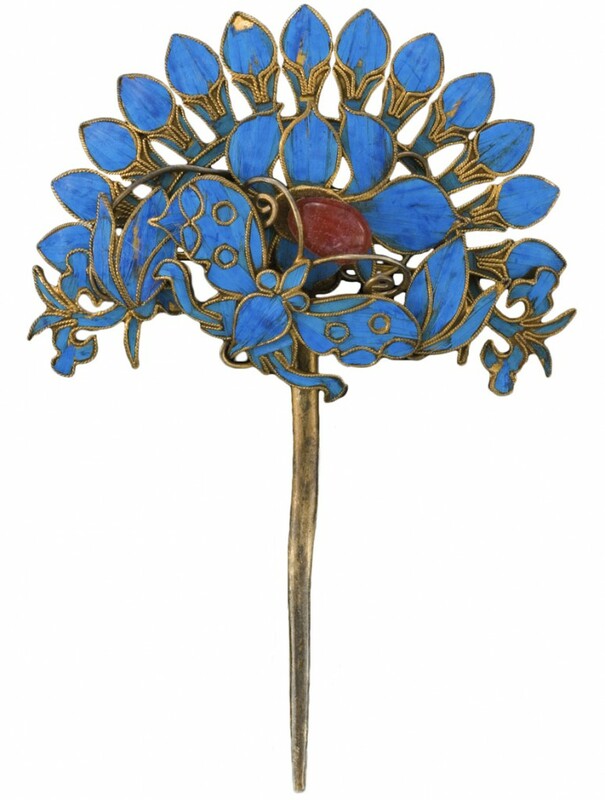 Top: A hairpin made with inlaid kingfisher feathers, courtesy the Shyn Collection. Above: The two cats symbolize marital fidelity, while the bat on one of the cat’s backs stands for blessings. Terese Tse Bartholomew has spent her life living among Chinese symbols and motifs, including almost four decades as a curator of Himalayan and Chinese decorative art at the Asian Art Museum in San Francisco. Despite her impressive resume, Bartholomew, now retired, takes a very down-to-earth approach to the pieces that have been her life’s focus. Sitting with her in her San Francisco home, Bartholomew is not self-conscious about the pieces she holds in her hand, despite the fact that some of them are hundreds of years old. Lifting them to the light, she handles them respectfully but familiarly, like one would treat an old friend. With every new object she shows me, another puzzle piece falls into place. 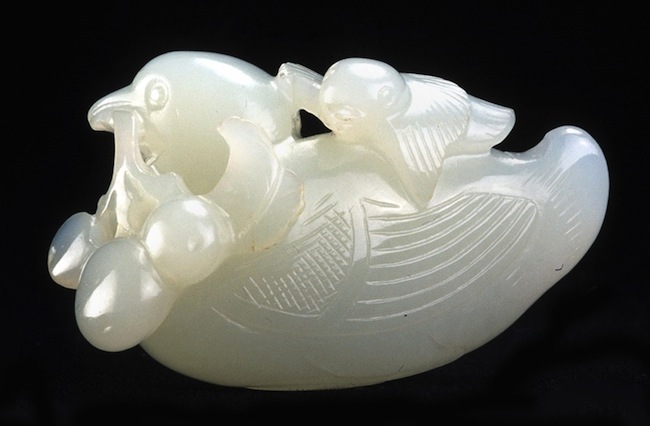 Carved nephrite lock pendants such as this one from the 19th century were given to infant boys to protect them. The peony is a symbol of wealth. That’s the first key to solving the Chinese-jewelry puzzle. The second thing to know about Chinese jewelry is its purpose. 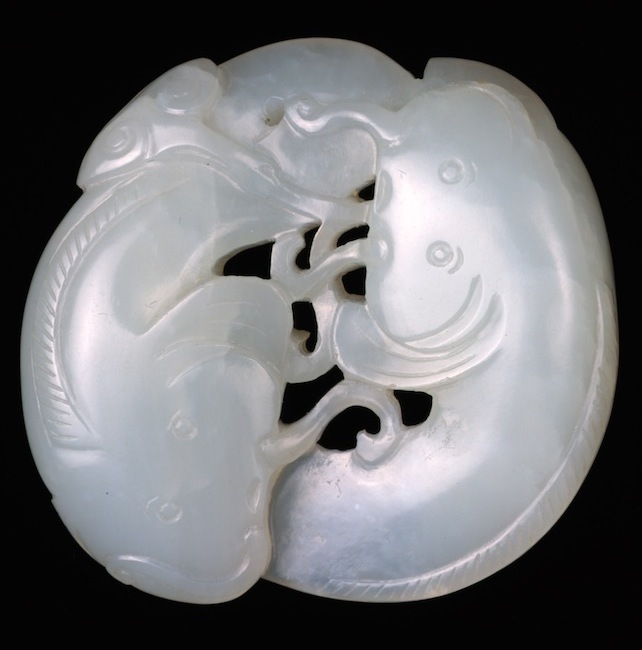 Because of its value, jade was frequently given as a gift to mark major family events such as births and weddings. As such, pieces of jade jewelry became vehicles for expressing good wishes and positive sentiments. Think of them as three-dimensional greeting cards, but with an exceptionally high degree of artistry. The three pieces of fruit in the beak of this nephrite bird express the wish that the wearer’s son may be the top scholar in all three Civil Service Examinations. You also had to be eloquent, which meant being able to write an essay based on a classic phrase from literature, and to know where the phrase came from. And you had to understand both the mechanics and artistry of poetry—test takers were required to compose a poem on the spot. It doesn’t sound like a system that could be gamed, but according to Bartholomew, with so much at stake, cheating was a real problem. Flower-basket earrings made of silver with polychromed enamel. Courtesy the Shyn Collection. Even if a boy did not have his sights set on being the first scholar, the pressure was still enormous. “Test candidates would commit suicide right inside the examination hall,” says Bartholomew. 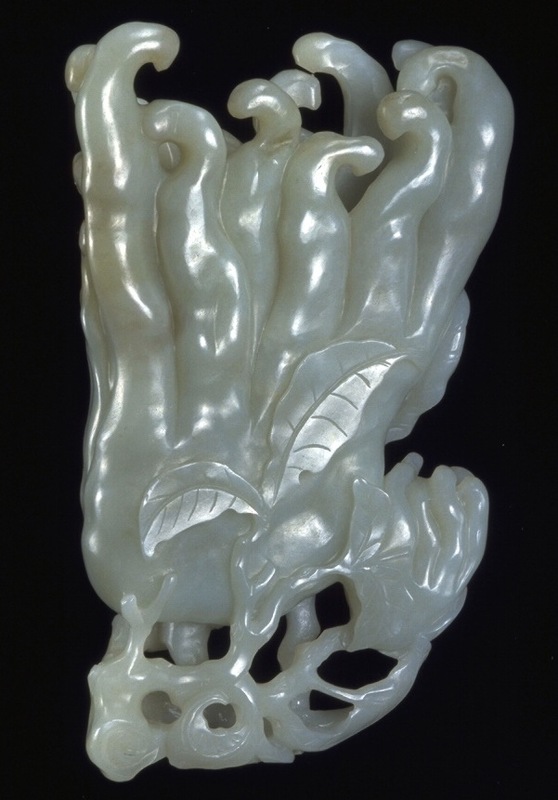 This Qing Dynasty piece of nephrite is carved to resemble fo Buddha’s-hand citron, which in Chinese is a rebus for blessings and longevity. The lock is not the only object whose meaning in Chinese jewelry is related to its actual purpose or physical characteristics. For example, pomegranates are filled with seeds, so naturally they symbolize fertility, specifically for the birth of many sons. Peaches, on the other hand, are symbols of longevity due to their association with the legend of Xiwangmu, the Queen Mother of the West, whose orchard in the Kunlun Mountains was filled with magic peaches, which were famously gobbled up by the Monkey King. “The magic peach trees bloom every 3,000 years, and the peaches on them take another 3,000 years to ripen. When that happens, you have a peach party, and if you eat one of these peaches, you will achieve immortality.” That’s why, says Bartholomew, peaches are associated with birthdays. Animal motifs on these silver rings include birds, lions, and frogs. Courtesy the Shyn Collection. The meaning of bats is purely homonymic. Bats are said to bring blessings because the word for bat in Chinese, fu, is a homonym of “blessing.” Moreover, bats are often depicted flying upside down because the word for that, dao, sounds like the Chinese word for “arrived.” Thus, upside-down bats translate as “blessings have arrived.” Often, bats are depicting in quintets to signify the five blessings: longevity, wealth, health, love of virtue, and a peaceful death. “It’s the best way to die,” Bartholomew says. In recent years, the market for Chinese jewelry has exploded in the United States and other Western countries as buyers from China have scooped up pieces confiscated from Chinese citizens, and then sent abroad, during the Cultural Revolution in the second half of the 20th century. 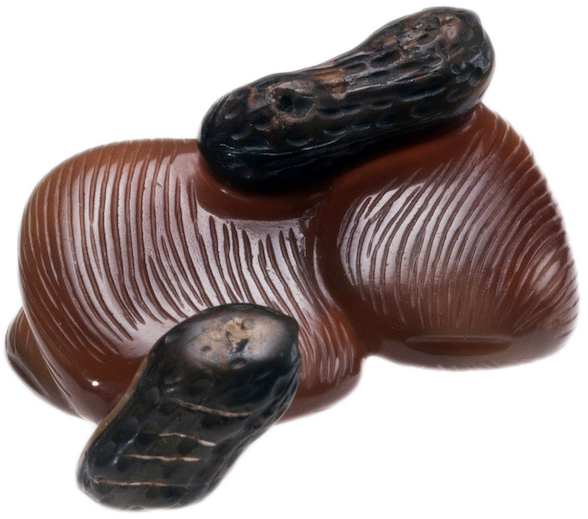 These pieces range from museum-quality examples of Ming and Qing Dynasty jade to modest Chinese puzzle rings, whose slender, interlocking silver loops can be nestled together to form a thicker band. Today, the Western press has mostly romanticized the Chinese jewelry and jade market here, explaining it as a desire on the part of wronged Chinese citizens to buy back the heritage that was stolen from them during the Cultural Revolution. According to Bartholomew, though, that’s only part of the story. Bartholomew says the main attraction of buying in the West is price. It’s really not a case of wealthy Chinese businessmen sentimentally rebuilding the collections of their grandparents. Rather, “Chinese buyers know they can buy quality pieces in the West cheaper than they can in China. They can then take these pieces back to China and either keep them or sell them at a profit.” Reclaiming heritage is part of the motivation, to be sure, but so is good old-fashioned speculation. 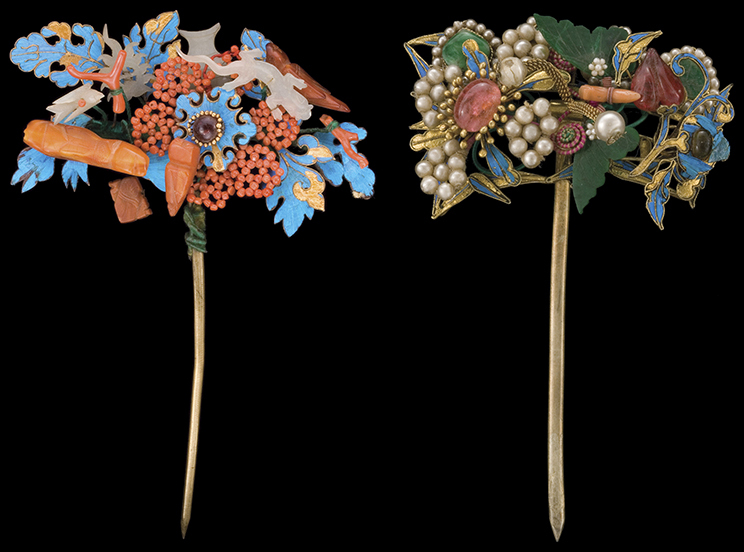 Decorative hairpins worn by the wealthiest Chinese women featured stones such as tourmaline and jadite, seed pearls and red coral, and iridescent kingfisher feathers. Animal motifs on these silver rings include birds, lions, and frogs. Courtesy the Shyn Collection. Jade objects, especially small pieces such as jewelry, have an additional appeal. In China today, jade is a fungible asset that’s actually better for some purposes than real money. “Another reason why people buy these things is for bribes,” Bartholomew says. “You can’t hand a stack of money to an official, but you can put a piece of jade on his table. People know what that means. Jade is jade.” As symbols go, the meaning of jade is well understood. Still, despite her career as a clear-eyed academic Bartholomew admits to having worn symbol-laden pieces of Chinese jewelry for essentially the same reasons as generations of women before her. “I wore one of these charms of the little boy riding on the unicorn,” she says, returning to the qilin she had pointed out earlier. “After I had a son, I loaned it to my sisters when they got married.” Does that mean Bartholomew believes these symbols have actual, unexplainable powers? “It worked for them,” she says with a smile. Thanks for this insight into the symbols involved in Chinese jewels. Great article! Loved the explanation of puns and rebuses…does the author mentioned, Ms. Bartholomew have any other articles explaining this? I’m studying Chinese and this part of the culture is fascinating to me. Great article! I love the Asian Art museum in San Francisco. My visit to China in 2008 wasn’t enough – if I could I would visit China every year. I loved it! Thank you for this research article. What’s the meaning of two jade locks on a Necklace?? It does not matter what’s the meaning of inlaying these pins with kingfisher feathers. The main thing is: the method of mining these feathers is the most vile cruelty – they were stuck the captured kingfishers on their backs or bellies, using their inability to move in this case, and pulled feathers from their living bodies. Nothing can justify this barbarity. This attitude to birds (who are the decorations, ornaments of nature by themselves) as to stones or metals, and not as to living beings. Grrr! Even the 5th century’s philosopher Bao Jingyan did not approve of this practice: he wrote in his treatise “when the pheasant’s feathers are plucked or the kingfisher’s torn out, it is not done by desire of the bird. “ ” I love to collect things that were never meant to be collected.